On Saturday, we commemorate the passing of 100 years since the ill-fated landing of Australian and New Zealand troops at Gallipoli on 25 April 1915. Their hope had been to charge across Turkey, take Constantinople and thus defeat the Ottoman Empire, ally of Germany, in the First World War. In the event, the landing was bungled, sending thousands to their death on the wrong beach and ultimately to defeat and retreat after eight months of frightful, senseless suffering. The endurance and bravery developed amongst these young soldiers became a watchword for the self-awareness of the Australian nation, then just 14 years old. Staff and students from every part of the University of Adelaide had volunteered for the War in these months, and for those sent to the Western Front in France even worse horrors followed. 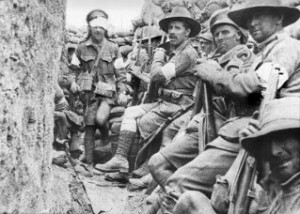 At Fromelles, a year later, Australia suffered 7,000 casualties in a single night. Revulsion at such events ensured that, while most had marched confidently off to the War, few returned unaffected. And 78 from the University did not return at all, their names now honoured with the dead of later wars on our campus war memorials: in the Mitchell Building, the Cloisters of the Union, and in the Dining Hall at Roseworthy. Every Australian of my age has stories of the damaging imprint of war on their own families. My father’s family, if asked about their service in the Second World War would fall mute. In contrast my grandfather, a British Sergeant-Major in the First World War, was endlessly haunted by memories of his task—capturing deserters and bringing them back to the trenches to be shot before their own men. He never recovered from his experience, and died a chronic alcoholic. We all grew up with Anzac Day. In my youth, the days of the Vietnam War, it was a controversial event: songs like that of Eric Bogle’s, “And the Band Played Waltzing Matilda”, used an allegory of the First World War to capture for us the ultimate stupidity of a new war in which few of us could believe. But how do we respond now to the armed conflicts across the world, in Afghanistan, Boko-Haram, Syria or the Ukraine? It is true that Albert Einstein once wrote, “we must be prepared to make heroic sacrifices for the cause of peace that we make ungrudgingly for the cause of war”. Yet this week few would have read with anything other than trepidation the news of our dispatching Australian troops to Iraq.